Economics grad aiming for a Ph.D. 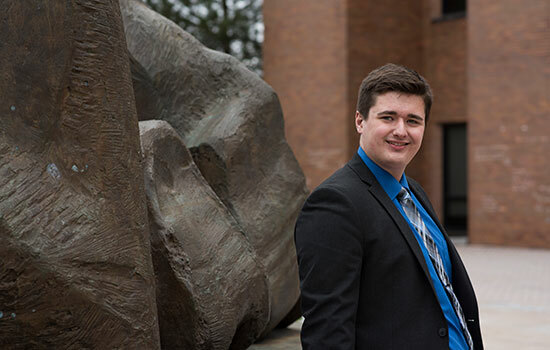 When Zachary Grzelka transferred to Rochester Institute of Technology in his second year as an economics major, he didn’t expect it would be a move that would become a stepping stone to shape his career as a college professor. After graduation in May, he’ll be heading back home where he’s been accepted into the economics Ph.D. program at Syracuse University, which has promised him five years of support via a combination of fellowships, research and teaching assistantships. For example, he’s studied environmental concerns and social welfare and interactions between firms and consumers. And for his capstone project, he co-authored an economic analysis of managing debris in the lower Earth orbit of space. Last fall, he presented his research paper at the New York State Economics Association annual conference on Long Island and in March, co-presented the revised and extended paper at the Midwest Economics Association annual conference in Chicago. While at RIT, Grzelka has been business manager for Reporter and worked as a peer mentor and tutor for the economics department in the College of Liberal Arts. While excited to begin his next chapter in his education, he says graduating from RIT is bittersweet. Professor Jeffrey Wagner, the economics undergraduate program director, has been Grzelka’s mentor. He has no doubt Grzelka would make a fine professor. While RIT does not currently offer Ph.D. programs in economics, Wagner says he’s proud RIT is able to act as a stepping stone and prepare students for higher degrees. Meet Hana Halilaj, a third-year School of Individualized Study student, is interning for MoMA’s International Program department, which is dedicated to connecting MoMA with an international network of artists, scholars and institutions.